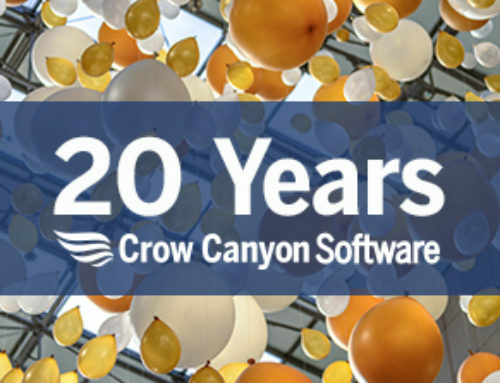 Crow Canyon Systems will showcase its powerful business applications that drive efficiency and productivity gains at organizations around the world at the SPTechCon, to be held in San Francisco December 5 to 8. Crow Canyon, a Silver Sponsor of this event, will be at Booth #603 in the Exhibit Hall on Dec. 6th and 7th. Crow Canyon will also be presenting solutions from its valued partner, KWizCom, including the KWizCom Forms and Mobile solutions. SPTechCon brings together leading SharePoint professionals and experts, major Microsoft partners, consultants and practitioners. The attendees will have the opportunity to participate in over 80 sessions and panel discussions which will help improve their skills and broaden their knowledge of Microsoft’s collaboration and productivity software. To learn more about the conference, please visit http://www.sptechcon.com. Attendees visiting Crow Canyon at Booth #603 will have the opportunity to meet Crow Canyon’s team of professionals, check out the company’s valuable offerings of business applications for SharePoint and Office 365, and get information on KWizCom Forms, as well as gain the opportunity to win a cool prize. The lucky winner will be announced at the end of the event. Crow Canyon provides powerful and flexible business applications for SharePoint and Office 365, including Help Desk, Customer Service, Employee Services, Asset Management, HR, Facilities, Marketing, Purchasing, and others. The company’s applications deliver critical functionality to organizations all over the world, including major financial institutions, government agencies, military units, colleges, corporations of all sizes, healthcare companies, and more. To learn more about Crow Canyon, please visit www.crowcanyon.com. Since 2005, KWizCom has provided innovative solutions and services to make SharePoint even better for over 7,000 companies worldwide. KWizCom’s solutions and services expand Microsoft SharePoint out-of-the-box capabilities, streamline workflow, maximize efficiency and enhance over-all productivity for hundreds of thousands of users. KWizCom, a Gold Certified Microsoft Partner, is headquartered in Toronto, Canada. Please visit www.kwizcom.com to find out more about KWizCom’s clients, people, partners and solutions.